Tag line: "Every Town Has Its Monsters"
2016 was a great year for horror films; instead of a top 10 list, I have a top 16, and some movies that would have made my list in previous years (Lights Out, Viral) didn’t make the cut. There were simply too many good ones to choose from, and among 2016’s most pleasant surprises was director Billy O’Brien’s I Am Not a Serial Killer, the gripping, frightening, and ultimately disturbing tale of a troubled teen who after witnessing a murder decides to take matters into his own hands. John (Max Records) is not your typical teenager. For one, he spends a good deal of his spare time at the funeral home that his mother (Laura Fraser) and Aunt operate, and even helps out with some of the embalmings. And aside from his buddy Max (Raymond Brandstrom), he doesn’t have any friends, choosing instead to pal around with his elderly neighbor Mr. Crowley (Christopher Lloyd). In addition to all this, John is a diagnosed sociopath, and he and his therapist Dr. Neblin (Karl Geary) have discussed at length how John possesses many of the characteristics found in your average serial killer. But when his small Midwestern town is rocked by several brutal murders, a fascinated John launches his own investigation into the killings, and in the process uncovers an evil that’s more dangerous than he ever imagined. The last time I saw Max Records, he was getting into sod fights with Carol, Judith, and all the other oversized monsters in director Spike Jonze’s Where the Wild Things Are, and back then I felt, based on his performance in that 2009 movie, the young man showed great potential. 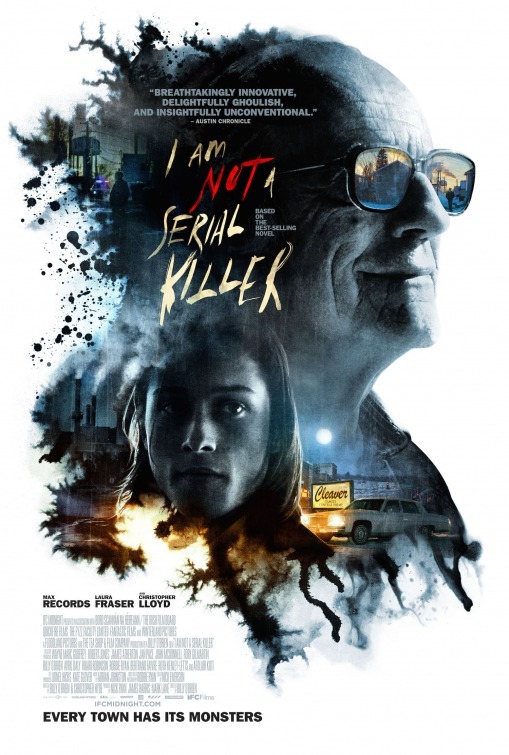 With his turn in I Am Not a Serial Killer, Records proves his earlier success was no fluke, and here creates a character who garners our sympathy one minute, then scares us the next (the scene at a school dance between John and local bully Rob, played by Vincent Risso, will send a shiver up your spine). Later on, as he’s stalking his town’s resident killer, we get the distinct feeling that John is learning more about himself than he ever did during his sessions with Dr. Neblin, and the various sequences in which he actually gets involved (trying to prevent further murders) are among the film’s most intense. Christopher Lloyd is predictably strong as the neighbor Mr. Crowley, as is Laura Fraser, who brings a vulnerability to the role of John’s mother, a feeling of helplessness as she tries to understand her son’s behavior but is unable to do so. Set during late fall / early winter, I Am Not a Serial Killer also takes advantage of its snowy landscape (it was shot on-location in Minnesota), enhancing the isolation that its lead character experiences through most of the movie (the film’s pivotal moment occurs on a frozen lake). Truth be told, I’d love to discuss this movie in greater detail, but to do so would run the risk of spoiling many of its best surprises, and while the CGI-heavy ending was a slight disappointment, I Am Not a Serial Killer still impressed the hell out of me. I’ve seen it twice now, and I intend to watch it again as soon as I can. The review of this movie in the horror movie podcast made me watch it. After viewing the film, I have since read two of the sequels. Hopefully, they will continue with the series.